Georgetown is home to plenty of high-end shopping, scenic waterfront views and historic landmarks that predate Washington, D.C. itself. Oh, and a whole lot of food. 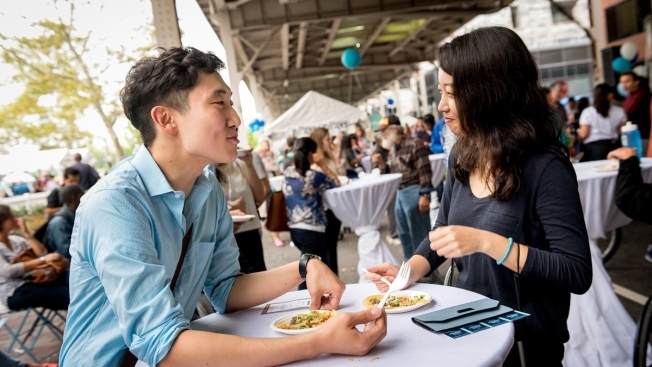 Coming up Oct. 3, you can indulge in a lot of that goodness during one of the the District's most anticipated annual food festivals, Taste of Georgetown. Enjoy creative tastes from more than 30 of the neighborhood's best restaurants, featuring both new concepts and established favorites. From 11 a.m. to 4 p.m., you can meander along K Street NW, between Wisconsin Avenue and Thomas Jefferson Street to enjoy sweet and savory tastes along a gorgeous waterfront view. This mouth-watering event will also include an expansive craft beer and wine garden, foodie competitions and kids' activities. Admission is free, but food is $5 per tasting, or $20 for five tastings. Beer and wine garden tickets are $4 per tasting, or three for $10. Buy tickets in advance online when they become available. Tickets will be sold on-site, but you can get discounts for buying multiple tickets online. Proceeds benefit the Georgetown Ministry Center, an organization that helps guide homeless people toward stability and housing.